The signed copy can be downloaded from the end of the page. Full text below. 1. To release a joint public statement that states, categorically, that killing fellow human beings based on colour, creed, ethnicity and religion is Haraam and against the Shariah. 2. To release a joint public statement that states that abusing the Prophet’s (Sallallahu ‘alaihi wa alihi wa sallam) family (including his wives), companions and relatives as well as the religious opinions and beliefs of Muslim groups is Haraam and is against the Shariah. 3. To release a joint public statement that states that the differences within the Ummah should never lead to issuing takfir against fellow Muslims, and if it does lead to issuing takfir we declare such action to be Haraam and against the Shariah. 4. 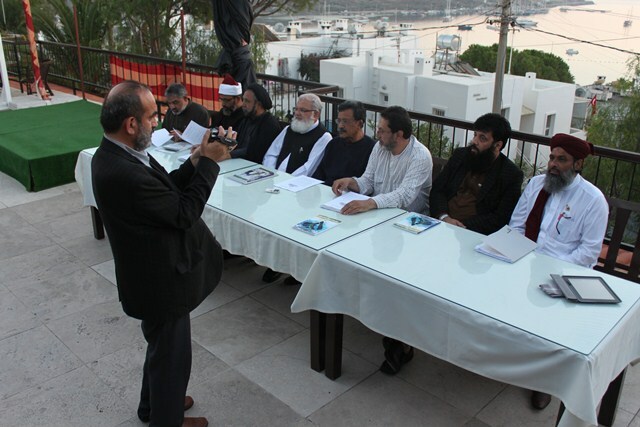 Whilst recognising that the foregoing passages are central to our aim, and to be upheld at all times, we agree to jointly issue the above statements in Muharram 1435 and will further develop these points jointly and individually and promote and encourage others to agree and live by these principles. 5. To jointly and actively establish and maintain relationships between our different schools and organisations as well as attending each other’s events and programmes as a way to establish, maintain and develop brotherhood. 6. To issue joint statements promoting harmony between all groups in Pakistan and promoting these statements through print, electronic and social media networks. 7. We recommend that the Madrasas within our spheres of influence should develop their syllabi and curricula to tackle the social, political and economic needs of Pakistan whilst also addressing the need for respect, harmony and peace between all members of Pakistani society. 8. We will lobby for the development and implementation of legislation to combat hate speech and push for more effective prosecution of violations of such legislation; and we denounce sectarian violence and killings carried out by vigilantes. 9. We will support UJN Charter 3:103 as a Quranic command to unite and hold on to the rope of Allah, as one Ummah and we will encourage others to support and sign the UJN Charter 3:103 (iii). 10. UJN(iv) agrees to support the promotion and dissemination of messages of unity and harmony by the signatories and their respective organisations through media networks and social media and help disseminate the messages worldwide. 11. UJN agrees to get a signed international statement of support, for points 1-3 of this declaration, by Ulema from all over the world. There will be a free flow of people, ideas, culture and commerce. People enjoy justice, peace, freedom and democracy. The wealth of the world is equitably distributed and poverty, dispossession, deprivation and discrimination are eliminated. There is a stewardship of the environment. The link between God and his creatures are strengthened and spiritual quest valued. Waste and over-consumption are discouraged. Pursuit of knowledge and universal values are encouraged and treasured. (v) Originals of this Declaration will be filed at the UJN Secretariats in London, UK (Islamic Human Rights Commission) and Penang, Malaysia (Citizens International) and copies will be issued to all the signatories.